I really like Sony's DualShock 4 controller. I use it a lot, both for playing games on PS4 and also, lately, for PC games. But there is one aspect I'm not wild about: Those slippery thumbsticks. 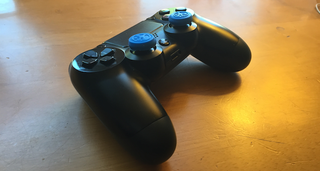 I like how the thumbsticks respond—they're nice and springy, and are a good height. But I don't love the material they're made out of. I haven't experienced the "disintegrating thumbstick" problem that some people have reported, but my thumbs do tend to slip off the thumbsticks, particularly if I've been playing for a while. I know that it's possible to perform surgery on your DualShock 4 and replace the thumbsticks with the Xbox One's less-slippery sticks, but that seems like a lot of work, so I'd been holding off. Meanwhile, I kept seeing photos of people's DualShock 4's with various types of colorful rubber nubs over the thumbsticks, so I decided I'd try some out. I did a little googling and settled on the Grip-iT Analog Stick Covers. (Note: I got mine from Amazon - our site automatically makes that into an affiliate link, so Gawker gets some small percentage of the sale if you click through and buy one. You can check out the Grip-it site here, and order them direct if you prefer.) Anyway, they were five bucks, so I figured, what the hell. I've been using them for about a week, and I'm a big fan. (They also work with plenty of other controllers, including the Xbox One, but I don't find the Xbox One thumbsticks to be very slippery, so I only use them on the DualShock.) It took a little doing to get them on right—there kept being an air bubble on the left thumbstick for some reason—but now that I've got them on, they've made my thumbsticks far less slippery. It takes some getting used to—the thumbsticks are now a tad squishier than I'd been used to—but after a few days, I can't imagine switching back. My thumb catches easily on each one and I never have to quickly "reset" my thumb in the middle of a game. I'm pretty new to thumbstick nubs, but I'm guessing a bunch of you out there use them, too. If so, what brand do you use? What controller? How do you like them? Have you found one brand to be better than others?